Dealing with utility connections can often prove to be a tiresome exercise. Many hours are required in obtaining quotations from the various utility companies and then keeping on top of them to make sure that the scheduled works commence on time. Generally this can turn out to be frustrating and sometimes costly when things go wrong. So, how can we help make your new developments utility connections as easy and straight forward as possible? Our no-nonsense approach to dealing with the various utility companies will benefit your operation on a number of your new developments. 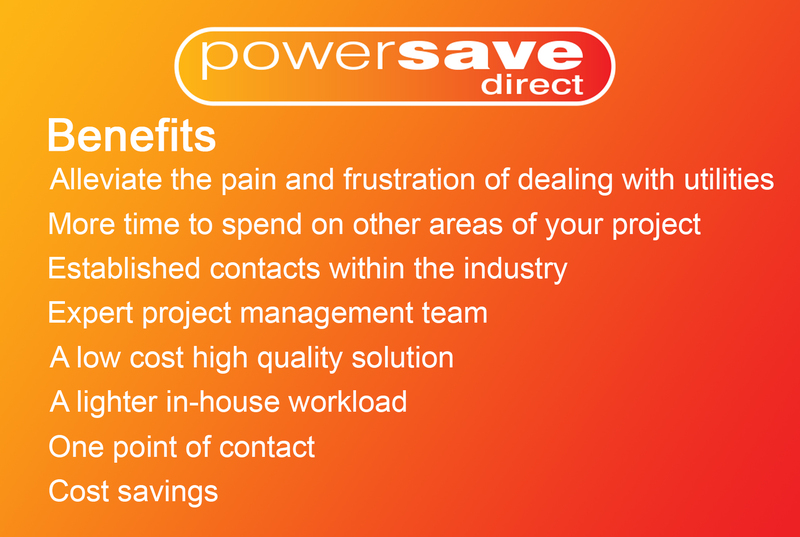 One of the main ideas behind Powersave Direct is that we are a time saving exercise for you and your clients so you don’t have to get involved with the utility companies and the associated time demands. Additionally the considerable frustration caused with dealing with them on a day to day basis is alleviated. For many customers, we feel there are two key areas of service that we are often able to help with and can prove invaluable to the successful completion of a project. Powersave Direct are aware that this task of obtaining budget quotations and plans of existing services can be frustrating to yourselves but is fundamental in enabling you to tender for contracts and ensures you will have the most accurate prices to support your tender. For your tendering projects we offer a full feasibility service of obtaining associated budget quotations for the new incoming supplies, capacity check information and existing utility drawings from all of the utility companies in the development area along with our Powersave Direct Ltd summary report. For your live / new developments we offer a permanent service to arrange & coordinate the various utility and meter connections associated with your new or existing projects, along with any disconnections or diversions which also may be required. Our experienced projects team will guide you through the process and by tendering to various contractors will offer you the most competitive prices available for your development, which could save you considerable monies. A designated project manager will look after your new developments from start to finish and will be on hand to assist you when required. If you feel that you could benefit from these services we would welcome the opportunity to work with you on your future developments.